important for their companies and 80% are trying to use it as an area of differentiation. While the lack of funding was the top problem last year, the lack of a clear strategy has emerged as this year’s No. 1 obstacle. There’s a lot of activity underway: 62% of companies have a voice of the customer (VoC) program, and nearly half have an executive in charge of their overall customer experience efforts. Our data shows that companies with this type of leadership have fewer obstacles and are more mature in their customer experience efforts. 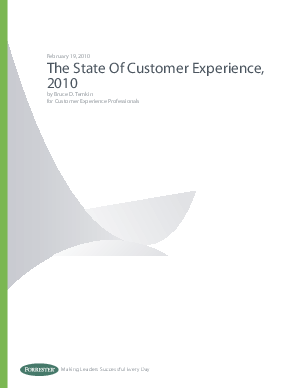 Get an insight to the state of customer experience of 2010 in this white paper.